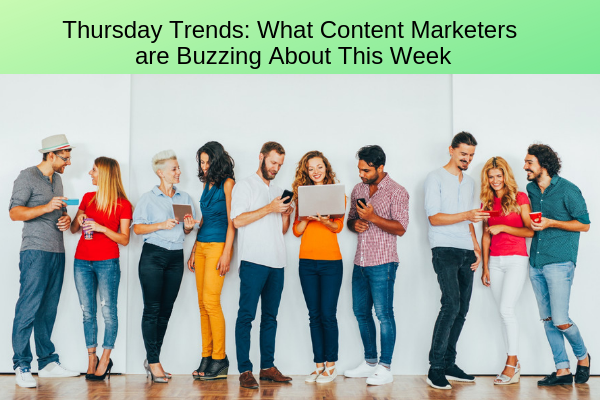 Posted on April 4, 2019 by Jennifer G.
If your content strategy is having an existential crisis, this edition of Thursday Trends will help it find a purpose once again. Give meaning to your marketing campaigns with lead generation tactics, expert advice, and 2019’s hottest marketing movements. Plus, take a break in front of the television, while you learn from some of the best fictional marketers around. Indelible Content Strategy Takes the Lead! Generating leads and conversions is the end-all-be-all purpose of implementing a good content strategy. It’s the reason we create content for content marketing purposes. So, what should you do if your content marketing doesn’t seem to be generating many leads? Forbes tells us that lead generation with content marketing in 2019 is all about adding value. They encourage creating long-form content that solves problems for clients, that is ripe for back-linking, and is also considered valuable enough to share. Check out the full article to see some impressive statistics and more advice on generating leads to take the content strategy lead this year. If you’ve ever enjoyed a guilty pleasure television show (something other than the news or a documentary), you might have considered it, like many, a waste of time. Time you could have been cleaning your house, exercising, learning a new hobby, or researching content strategies. Wisdom, however, can be found in unexpected places and lessons can be learned from even the guiltiest of guilty-pleasure TV. This article from WriterAccess points out a few marketing geniuses lingering inside the “idiot box.” This article suggests that rarified marketing expertise lurks in some of our favorite shows like Game of Thrones, Breaking Bad, and others. Tune in to this article to find out what marketing secrets you can learn from a bit of primetime relaxation. You don’t want your brand or your marketing to seem outdated — unless you intentionally want to appear retro or vintage, in other words fashionably outdated. So, it’s important to keep up with and even stay ahead of the latest trends. Deliver fresh content in new and exciting formats to keep your audience on the edge of their seats waiting to see what you do next. Entrepreneur discusses three marketing trends on the cusp of being the next big thing in marketing in 2019. This includes artificial intelligence, interactive media, and more. Read the article to find out exactly how you can use these marketing trends in your content strategy. Sure, you can learn a lot about marketing from online articles, books, seminars, and good-old observation, but there are certain lessons that can only be learned from experience. Forbes brings us experience-based advice from some top marketing pros in this highly useful article. This advice covers everything from delivery and sales to conversations and data. Take a look to see what advice these experienced marketing gurus can offer your next campaign.